The world sees the grandeur of the Russian Armed Forces marching during the annual May 9 parade in the heart of Moscow. However, even smaller towns in the country mark the holiday with a great degree of enthusiasm and reflection. Eleven years ago, I noticed the Red Star lanterns on the streets of Yuzhno-Sakhalinsk on the eve of Victory Day. Most people I knew, especially my student friends, were in party mode and didn’t think the working days in between the two stretches of May holidays were a reason to get serious about work or studies. Towards the end of all this revelry that could be in some way compared to the New Year break, came a sombre occasion, a morning of reflection and gratitude. The lanterns symbolize the brave and valiant Red Army, which won the deadly war that destroyed many parts of the world and turned most of European Russia into piles of rubble. In 2003, Yuzhno-Sakhalinsk, like all cities and towns in the country, had a small military ceremony at its World War II memorial. This was probably the first time I witnessed anything resembling a large crowd in the town of 180,000. It seemed like the entire population of the city was by the square to watch the proceedings. A large number of people paid floral tributes with expensive bouquets. The red roses stood out in deep contrast to the black marble of the monument and the grey skies. 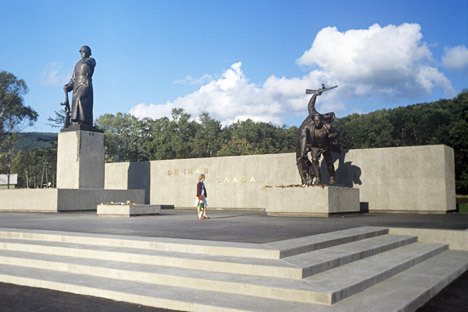 27 million people from across the Soviet Union lost their lives in the Second World War. It would be difficult to find a family in the smallest of towns that didn’t lose someone in the prolonged conflict. I was met with a few odd but admiring stares when I laid flowers at the memorial. A man in his 60s approached me and asked me where I was from. When I replied that I was from India, he lit up and said he was sure that Indian history books mention the Soviet sacrifices in the war. After expressing gratitude to me for showing so much respect to my host country, he brought up the topic of the Kuril Islands. “I am dead against Russia giving even a small part of the Habomai chain to Japan,” he said. “No land should ever be given back to a country that allied itself with Nazi Germany,” he went on. In May of 1945, Yuzhno-Sakhalinsk was still ruled by the Japanese and called Toyohara. The Soviet Union managed to evict the Japanese from the southern part of Sakhalin by September of that year and many war veterans were resettled on the island. They brought with them, tales of the horrors of the war and of life in Nazi labour camps. The Soviet and Russian authorities have stood against the very concepts of Nazism and Fascism and opposition to these ideologies are among the foundation of the modern Russian state. This is why organisations from Ukraine like the Right Sector and the Svoboda Party are denounced in Russia. The cultural programmes follow the solemn ceremony and the military parade. Such events generate a great deal of enthusiasm especially among the younger people and they appreciate being watched by a foreign audience. The programmes are a bit more colourful in the Russian Far East since they also feature performances from the indigenous people of the region. After the cultural programmes, it’s time for outdoor barbeques and enjoying the spring weather. My first Victory Day really did feel like a Spring Day with temperatures crossing 15 degrees above Celsius (59 Fahrenheit). The holiday is like a point of no return for the winter. The summer months and vacations lurk in the background. Over the next few years, I watched the celebrations in different parts of the Russian Far East. The grandest celebration is in the port city of Vladivostok, with a parade featuring the Pacific Fleet. The city also hosts its fair share of concerts, which are organised and largely attended by the ever-present student community. The firework display by the seaside is also the best one can see in the country after Moscow. The most memorable of the Victory Day celebrations that I have seen was in the small town of Alexandrovsk-Sakhalinsky, a town of 10,000. This was the biggest occasion for the residents and the entire town participated in some way in the festivities. It wasn’t about grandeur or pomp, but for a historic town whose population has been halved in the last 5 decades this was a great display. This sense of community is something I have never witnessed in many parts of Russia. There are thousands of towns spread across the massive Russian landmass and Victory Day is as good an occasion as any to see the best of modern Russian culture. The end of the war led a long process that brought about an unprecedented level of cooperation in Western Europe. One can only hope that in our lifetimes, borders become as irrelevant everywhere as they did in some of the hottest contested regions during the Second World War.